With over 40 years motor trade experience, Andrew Green Exclusive Cars have been established at their current site in Ilkey near Leeds for over 26 years. We are proud of the personal service that we provide, and even more so of our local reputation, and the majority of our business is with repeat customers. We are a member of the Good garage guide where from over 500 customer reviews we have a satisfaction rating of over 97%. Please follow the link to The Good Garage Scheme to see for yourself! Having 30 years' experience as Vehicle Sales and Service specialists we have built up an enviable local reputation for providing quality products at great prices. With the opening of our Service and MOT Centre we can now cater for all makes of car, whether it is sales, service, parts, mot... indeed anything for your car! 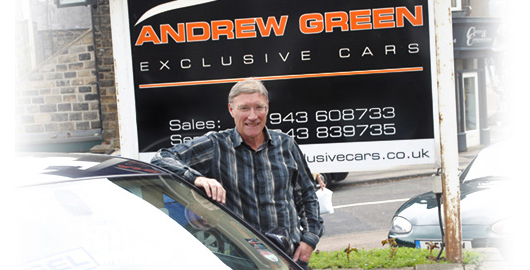 So please visit us at Andrew Green Exclusive Cars in Leeds, a local company that always puts the customer first. No matter what you need we will do our best to supply it!